Summary: I have put four hours to do this walk at a leisurely average of two miles per hour but I would not excuse anyone for taking longer as this walk is likely to stop the walker on more than one occasion. The reason? There are lots of interesting places to stop and look around in wonder, or simply just to take in the surroundings. 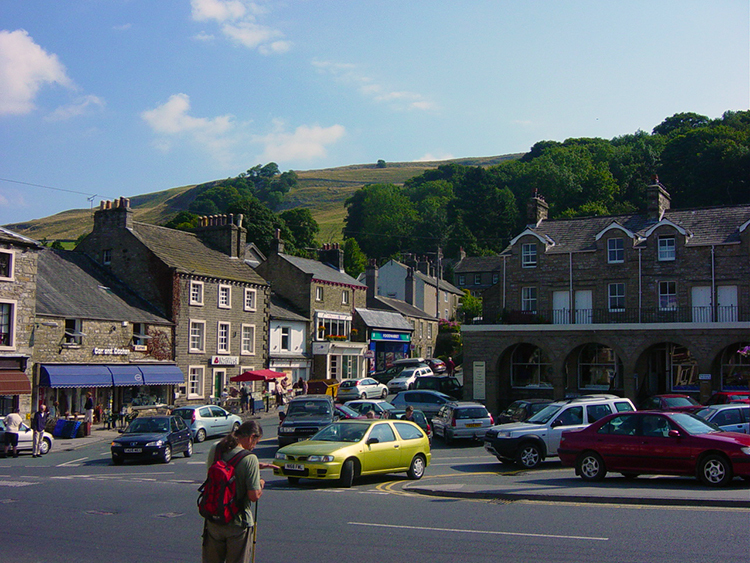 The notable ones start with the market town of Settle, one of the best Yorkshire Dales towns there is. 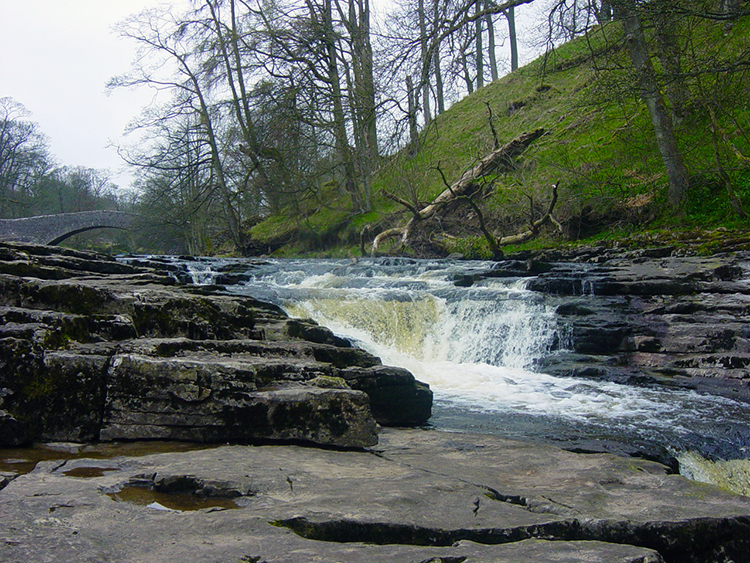 After the town there is Stainforth Force, a small but neat and compact waterfall which is a spot for watching Salmon leaping in the breeding season. 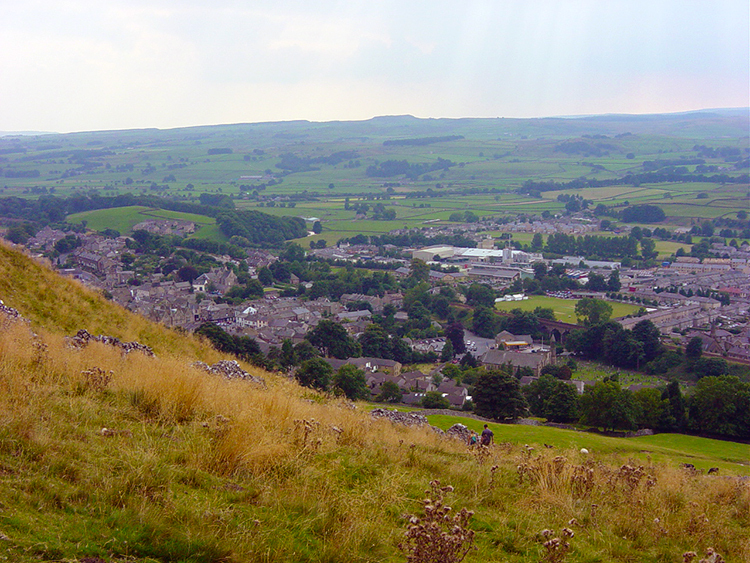 Then there is Stainforth village, another place of beauty before climbing to Catrigg Force, a secluded waterfall best viewed in a sunken hole before climbing more to Victoria Cave, once home of Bears and Reindeer and from the cave to the glittering limestone outcrops of Attermire Scar. The finale is a quick steep descent back into Settle which provides lovely overhead views of the town. 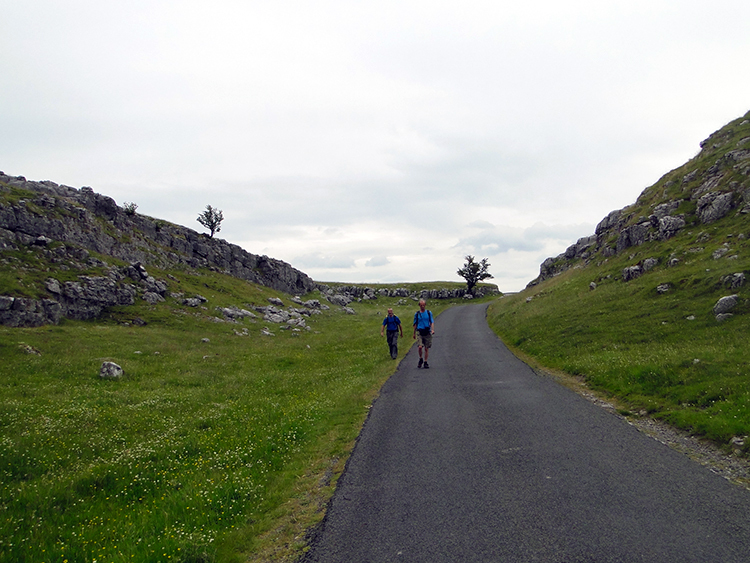 The Walk: I designed this walk while researching a series of walks for an American lady who wished to do walks of less than 10 miles which she could access from a railway station on the Settle to Carlisle line. I am so glad I did, this walk is full of exciting places in the Yorkshire Dales and such diverse ones too. I started my day by driving to Settle, unlike the lady I was not restricted to using a train, and then taking time out to enjoy a coffee in one of the excellent cafes in the town. Then I set off on my walk by leaving Settle and walking north by following the River Ribble upstream along the Ribble Way towards Stainforth. The River Ribble is the only river which originates in the Yorkshire Dales and heads west into Lancashire. All the other rivers and becks that arise on the Dales follow an east course either to converge with others or to disperse their waters into the North Sea. I followed this unique river upstream for three miles, sticking pretty close to its west bank apart from a detour at Stackhouse, until I eventually reached Stainforth Force. The waterfall begins as a series of small cascades followed by a final slightly larger one of approximately 4 feet. It is a spot well known for catching sight of Salmon leaping in the breeding season. So if you're here in October or November take time to have a look for one leaping out of the water. 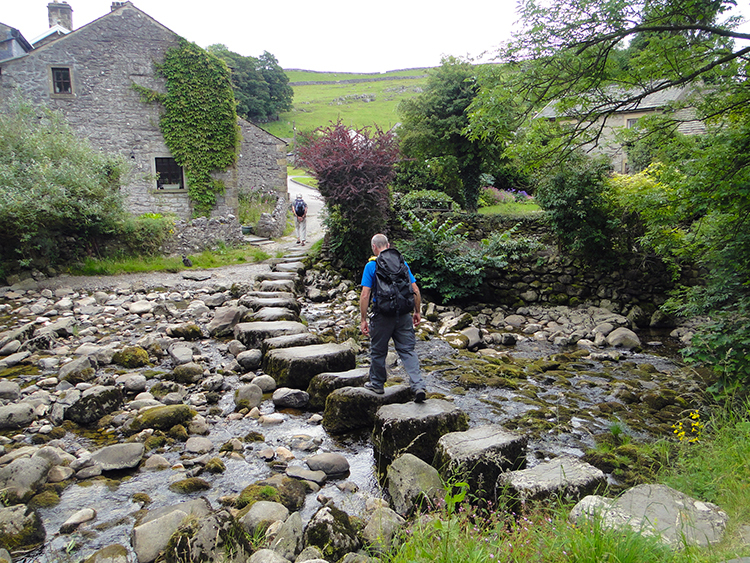 After enjoying the rushing water in the River ribble at the waterfall I left the course of the river by crossing a stone bridge and walking into Stainforth. The village is a quiet hamlet and I have often walked through the village without seeing another person. This time I saw the postman commuting very short distances in his post van to deliver letters and parcels to the villagers. I also met a couple of other walkers who were on their way to Catrigg Force which was also my destination. I let them go ahead while I stopped at the Craven Heifer for another coffee and a leisurely read of the papers. I was in no hurry. About an half hour later I took the track eastwards out of the village which began by a stepping stone crossing of Stainforth Beck and then continued with a brisk ascent to Catrigg Force which is a magnificent hidden waterfall I always love to visit when in the area. 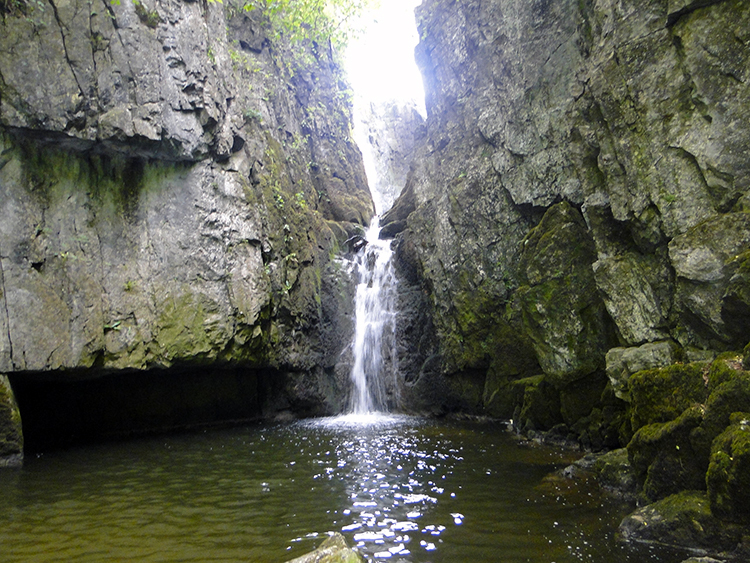 It is a special place, the waterfall hides from view in as deep sunken gorge which is home to its own micro habitation. There is a copse in the depth too; when beginning the steep descent to the waterside I was above the top height of the trees but soon down to staring up at the tree canopy. When I could divert my eyes from the waterfall though. I reiterate without reservation - the environment around Catrigg Force is a really special place. The rest of the walk after I dragged myself up and our of the wonderland of Catrigg Force could have been a huge anticlimax but there were more thrills to be had on this most interesting walk. 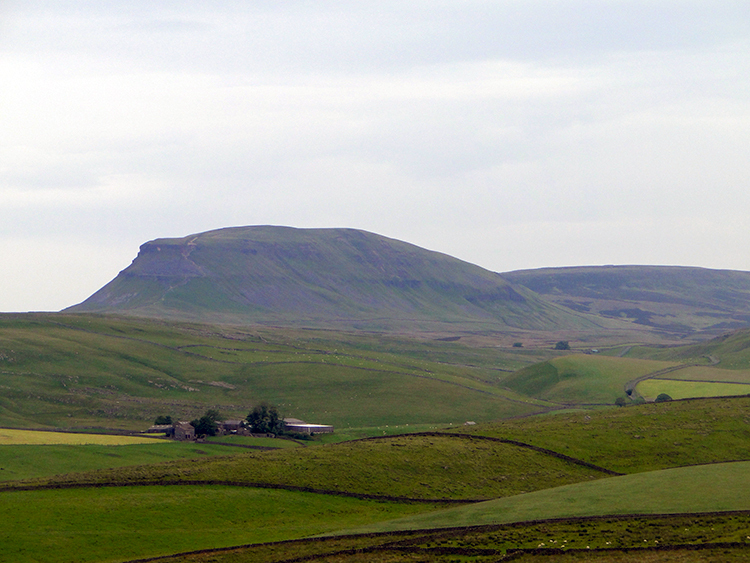 The first one was immediate as the view north over the fells to the majesty of Pen-y-ghent is a draw. The marvellous bulk of the mountain is an awesome sight and one I continued to eye as I headed south to Upper Winskill and on along the quiet road in the area of Winskill Stones, a 74acre area of limestone grassland and limestone pavement which is another delight on this thrill of a walk. 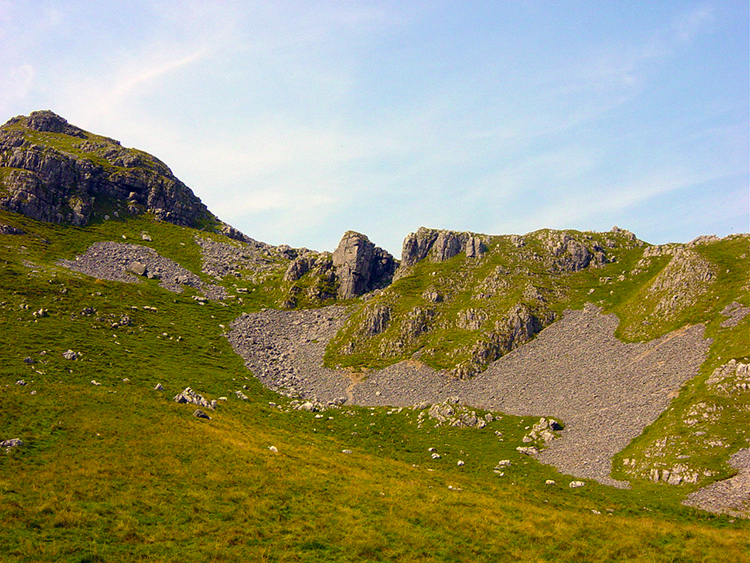 After getting past Winskill Stones which I admit to cavorting and bounding over I came to more limestone outcrops and an area of scree caused by Brent Scar. I looked for a hole in the scar, a very famous hole which is the entrance to Victoria Cave which was discovered by chance in 1837 and since then has been completely excavated. Early excavations by enthusiastic Victorians uncovered areas of bones. The earliest, at 130,000 years old, included those of hippos, narrow-nosed rhino, elephants and spotted hyenas. It is thought that during the later Pleistocene age when our ancestors were coming out of what is now Africa the hyenas were using the cave as a den and dragging scavenged bones back to it. 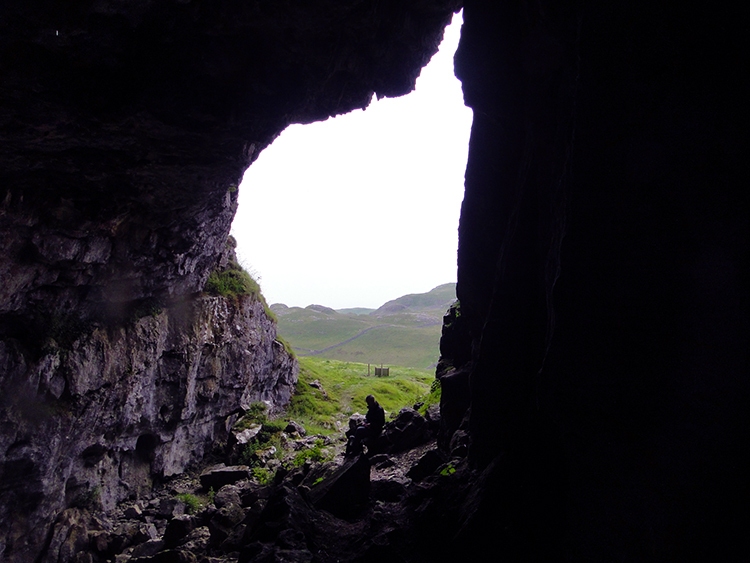 Reassuringly there are no hyenas around now so after a brief inspection of the cave I continued along Brent Scar towards the unique shaped trio of cones which make up Warrendale Knotts. Walking past these to my left would allow access to my next area of interest. And my next point of interest was another of my special Yorkshire Dales places. After walking down a path which was part scree covered I levelled off to view the magnificent limestone outcrops of Attermire Scar. These combined with Warrendale Knotts are a series of scars which provide scenes of exquisite beauty, best seen in sunlight and if clouds sweep across to provide fleeting shadows then I could imagine standing watching the moving scene for quite a long time. 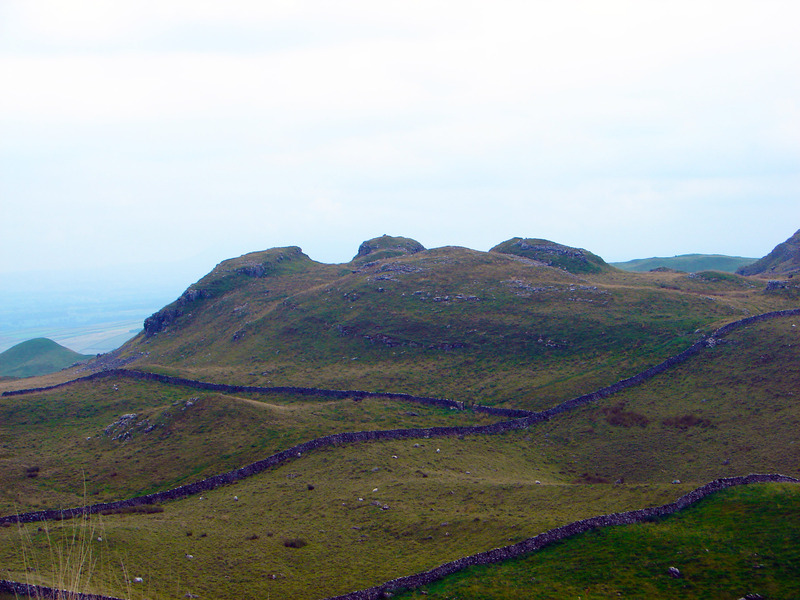 Indeed I have done so in the past, this time there was more cloud than sum but I still looked on the features of Attermire scar in awe as I walked along them and then away on my course back to Settle. The final mile saw me begin a steep ascent into Settle from near Blua Crags from where I enjoyed lovely rooftop views of the town. Then I descended further to finish my walk. I had no doubt the American lady would love the walk; just as I did.